Lebanese UPS systems market is gaining momentum owing to rise in IT spending, IT infrastructure, power fluctuations, and need to reduce data loss due to power irregularities. The demand for medium KVA rating (5-50 KVA) UPS systems is projected to grow substantially during 2018-24, across industrial and commercial applications. Commercial sector is the major consumer of UPS systems in the overall Lebanon UPS systems market, followed by the industrial sector. Upcoming projects such as Le Mall, The Address and Awkar US Embassy Compound would generate more demand for UPS systems in retail, offices, healthcare and other commercial segments. 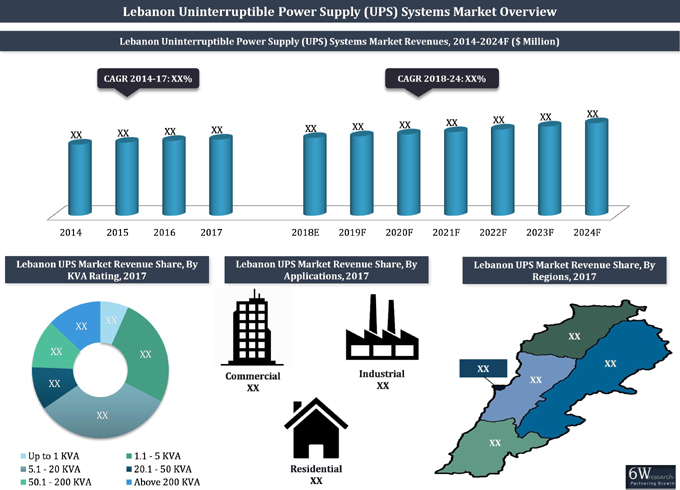 The report thoroughly covers the Lebanon UPS systems market by KVA ratings, applications and regions. The report provides an unbiased and detailed analysis of the on-going trends, opportunities/high growth areas, market drivers which would help the stakeholders to device and align their market strategies according to the current and future market dynamics. 13.9 AEG Power Solutions B.V.